“Who you gonna call? …Rentbusters!” This unprovoked comment comes from a William Whyte resident after learning about the Tenant Landlord Cooperation (TLC) program – a housing initiative that has people excited enough they’re rewriting the lyrics to the Ghostbusters theme song. Daniel Ranville and Lindsay Schaitel, TLC program coordinators, have just finished a presentation at the William Whyte Residents’ Association’s monthly meeting. 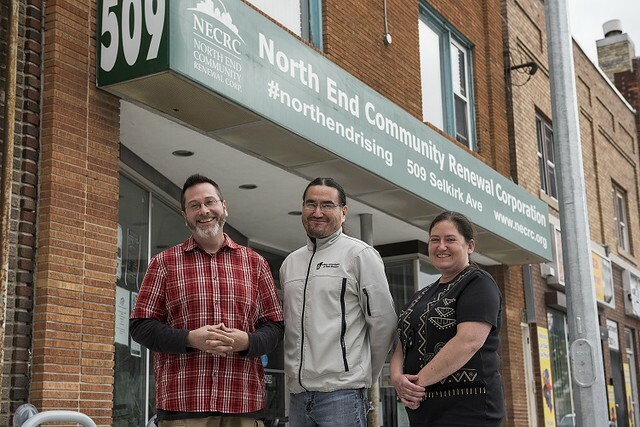 An initiative of the North End Community Renewal Cooperation, TLC is a grassroots program aimed at improving housing conditions, assisting tenants in finding housing and landlords in finding tenants, and preventing homelessness. Coordinators work closely with the local community to deliver workshops, conduct rental property inspections, and assist residents’ associations in addressing problem rentals. They also advocate for tenants and help recoup damage deposits, fight illegal rent increases, get repairs done, and more. Coordinators also recognize and promote responsible landlords, and inspect rental units so landlords can qualify for fix-up grants. It’s a busy job! Last year, the two-person team completed more than 800 calls, of which 273 were advocacy files requiring three or more hours of work each. They also helped clients recoup more than $90,000. TLC helped Ms. Openshaw navigate the legal process. The courts found in her favour but the landlord has yet to pay up. “I have to garnish his bank accounts. I have all the paperwork drawn up. I just have to come up with the money to get it processed,” she explains. TLC also works closely with landlords, and sometimes things aren’t as they initially seem. Take the case of a rooming house owned by Yu Kai Gan. Through a story on the news, TLC learned Mr. Gan’s illegal rooming house was being closed down. Since TLC works to reduce homelessness, Mr. Ranville went down to find out where tenants were going. “Initially it looked as though Yu Kai was a very bad landlord. So I went over to find Yu Kai, and I chatted with him, and he immediately wanted some help. I could tell right away there was a language barrier,” Mr. Ranville says. Turns out Mr. Gan hadn’t intended on running a rooming house. He had purchased the property, did extensive renovations, and was renting out the rooms as shared accommodation for the fairly reasonable rate of $550 per month. “Maybe somebody is saying I’m a bad landlord, but in my heart I am the best,” Mr. Gan says. But after tenants who’d forgotten their keys repeatedly kicked in the front and back doors, Mr. Gan decided it made sense to put locks on individual rooms. That, along with other fire-code violations, led to the property being labeled a rooming house. Mr. Gan isn’t sure what he will do with the property, but may convert it back into a duplex, or apply to have it rezoned as a triplex. The North End is a vibrant community that holds enormous potential. The Tenant Landlord Cooperation is an important program that serves hundreds of clients each year. Staff work to improve housing conditions, assist tenants and landlords, and prevent homelessness. It’s a busy job. These pictures give you a snapshot into the work. They were taken the week of Sept. 12, 2016. This story is featured in the Fall 2016 issue of our Working Together magazine. Download or view the full issue on our Publications page.